The Joe the Cab Driver card trick is a variation of the more famous Little Joe card trick and Sam the Bellhop trick. Video samples of the Little Joe and Sam the Bellhop tricks are more abundant and provide better examples for those examining the fine points of the trick. The most important parts of the Joe the Cab Driver trick are arranging the cards in the order of the story and memorizing the story. Depending on your skill level, you can either perform false shuffles or count cards in order to hoodwink the viewers. Decide whether you are going to count cards or perform false shuffles. False shuffles are more difficult to carry out, but if performed well they can accentuate the trick. For this example, counting cards will be explained and false shuffle examples are noted in Resources. Memorize the Joe the Cab Driver story. Since the story is quite long, watch the video Late Night Card Trick (See Reference 1) to get an idea of how it goes. The order of the cards for this version of the trick is: six, four kings, two, four queens, two, four aces, two, four jacks, two, eight, four 10s, two fives, three threes, five, seven, three, four, eight, seven, four, two sixes, eight, seven, four, four nines and a straight flush (numbers four through eight) of a particular suit you choose. Tweak the story if you like, but remember that the story must finish with a straight flush, so the final cards' suit must be the same. Choose someone to split the deck before each trip Joe takes. Now, the bottom of the deck, with all of the numbered cards that come up near the end of the story, is on top. After the deck has been split, Joe drives the city blocks to pick up the kings, queens, ace liquor and jacks. Count the cards. As you put down cards to represent Joe driving city blocks, you will be able to recognize where you are in the deck by what numbers you pull up. The most important part to recognize is the straight flush at the end of the deck. From there you know how many cards to put down before you reach the face cards on the top of the deck. 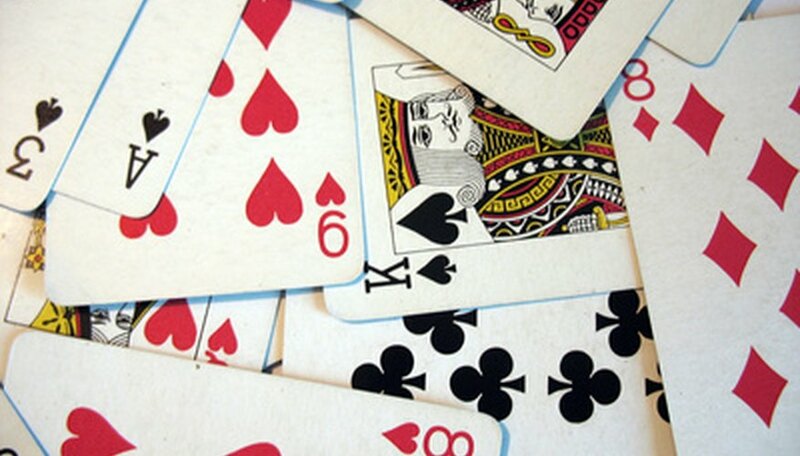 You only need to count cards until the point in the story where Joe picks up the jacks. After that it is up to your story telling skills to keep the audience fascinated. Dan Tinning holds a Bachelor of Arts in world literature with a minor in philosophy from University of Illinois Urbana, Champaign. He has been published in various student journals and has been writing since 2007. He works as a quality-control lab assistant at NOWFoods, the current industry leader in vitamin supplements.